Please Pray for the Faithful in India! Please remember our suffering brothers and sisters in India in your prayers and Masses. As we know, since December last year scores of parishes have been attacked and many laity, religious and priests beaten and murdered. In the Orissa state where more violence erupted in the last few weeks, we have now heard that in the last day or so another two Catholics have been brutally murdered and their bodies mistreated. Let us pray that the faithful will have God's blessing and protection at this time and that the world will not remain indifferent to their plight. Lord have mercy on them and their persecutors. 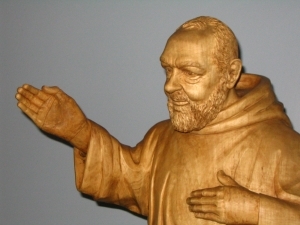 After the anticipation of the St. Pio Day of Prayer during Sunday, now the Feast of St. Pio of Pietrelcina has arrived! With what joy may we celebrate the feast of this powerful saint for our times! Such is his greatness that when we think of St. Pio we each have a favourite aspect to reflect on. There are of course his sacred stigmata; the wounds of Christ which he bore for 50 years of silent suffering. Then there are his bilocations during which he mysteriously helped many, obtained healing for others and even confessed and absolved the dying in their own homes without leaving the friary at San Giovanni Rotundo! There is his mysterious perfume sent all over the globe to encourage, strengthen and warn his spiritual children in the midst of trials and temptations, or to call them to his presence. There are the countless miraculous healings, accurate prophecies and mysterious knowledge. 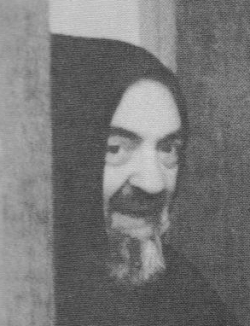 There are his long hours every day in the Confessional; reading souls and bringing countless individuals to genuine repentance, reform and renewal of their life as Christians. And central to all of this were his beautiful celebrations of Holy Mass, during which he experienced the Passion of Christ, his wounds bleeding and his heart and soul bursting with the love of God. He taught that 'A day without the Holy Mass is like a day without the sun'. 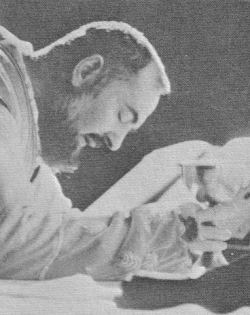 St. Pio gave himself to God during his youth as a victim soul to respond to the call of the great Pope St. Pius X for such souls to repay and defend against the errors of Modernism; which, as the Saint and Pontiff accurately prophecied still dog the Church today. He is truly a saint for our times and a powerful icon of the love of God, redeeming the world in Jesus Christ. He is a sign of contradiction to a world which rejects God's Law of Love. 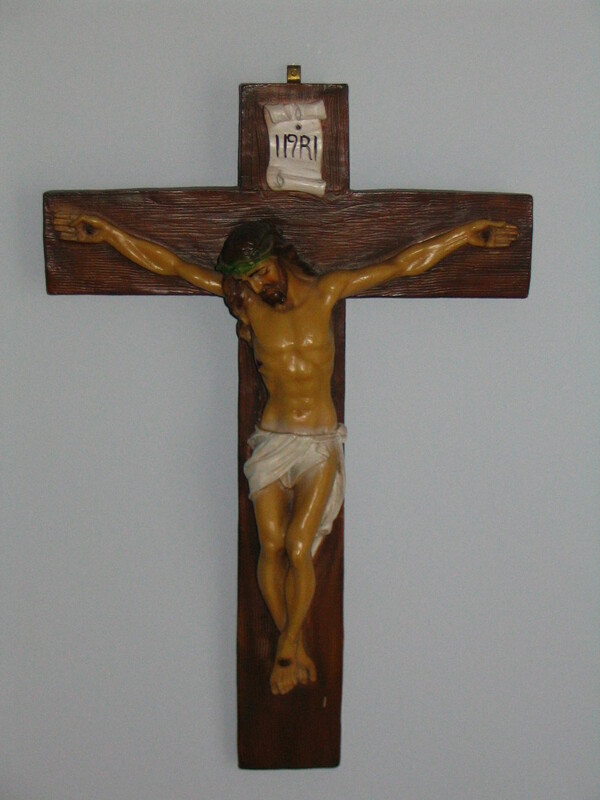 St. Pio presented the 20th century and beyond with a living, praying, teaching, bleeding, Crucifix. He confounded the limits of science, won the hearts of sinners and showed forth the power of the Church and her Sacraments as the means to a happy and blessed earthly life and eternal peace and beatitude with God. St. Pio makes us laugh because he teaches the way of true happiness. His appeal is thus universal and shines as a light to young people, the aged, the lonely, the misunderstood and the suffering. He teaches us that there is nothing more miserable than sin and that true joy and liberty only come from repenting and confessing all our sins with sincerity and walking forwards as children of God. He told us to pray, hope and not to worry; God has the last word of love over sin, limitations, suffering, persecution and death. Because he loves us so much and we love him back, we are going to develop and launch a St. Pio page on this website which we will add soon. Please pray that St. Pio will help us with this so that more souls may be reached. 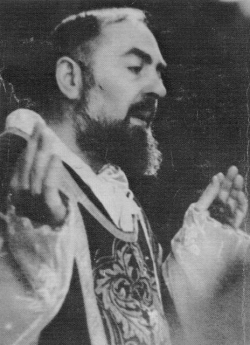 St. Pio; priest, monk, shepherd, spiritual father, confessor, healer, and alter Christus who taught that prayer is the key to the heart of God - pray for us! Help Keep Northern Ireland Free From Abortion! 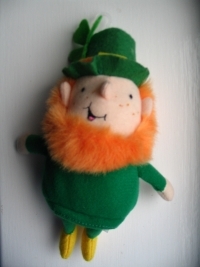 Our affectionate friend from the 'Emerald Isle' asks for your help! The good people of Northern Ireland have consistently and democratically shown that they do not want abortion on their land. Now some MP's at Westminster are trying to foist abortion on the people against their clearly demonstrated will by adding amendments to impose abortion on Northern Ireland in the proposed HFE Bill. If you have not yet signed the petition against this amendment and are a British citizen then please click the link below and add your name. Remember; it often only needs small stones to start a landslide - every name counts. Newflash - Prayer Urgent for Catholics in Vietnam! !Please pray for the Catholics of Hanoi! Independent Catholic News is reporting that the authorities in Hanoi have begun to demolish the Apostolic Nunciature building and have laid seige to the Archbishop's Residence, St. Joseph's Seminary and the Convent of the Sisters of The Adorers of the Holy Cross. Government vehicles are also using blocking technology to prevent mobile phone signals to the Archbishop, whilst the seige is imposed by police, militia and security personnel with dogs. The bells of Hanoi Cathedral are being tolled at intervals to call for prayers and thousands of Catholics have taken part in peaceful, prayer demonstrations on the streets. Please join our hearts and prayers with our brothers and sisters in Christ in their hour of need! The papal flags were flying and St. Pio pulled another glorious sunny day out of the bag for the biggest St. Pio Day of Prayer of the year. 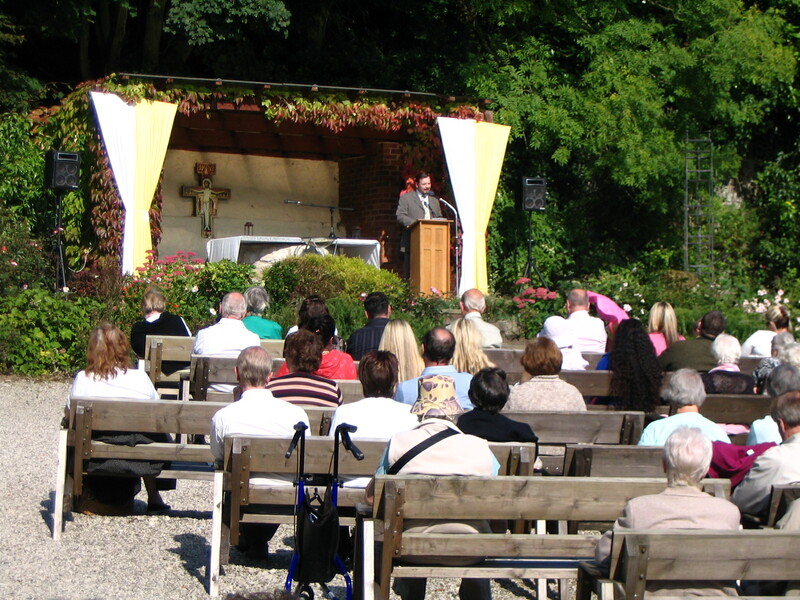 This meant that the approximately 400 pilgrims who had travelled from far and wide could enjoy the whole day in the outdoor National Shrine of St. Pio. Fr. Louis Maggiore OFM Cap. warmed us all up with a hearty and soulful rendition of Nobody Knows the Problems I Have! which he adapted to relate to the help we get from Our Lord, Our Lady and St. Pio. Then Fr. Keith Windsor OFM Cap. led us in the Rosary mysteries. Here he is in the entrance to the outdoor National Shrine with the great saint's picture in the background. Fr. Paschal Burlinson OFM Cap. was the main celebrant at the Holy Mass and he preached about the Hail Holy Queen prayer; which was so dear to both Fr. 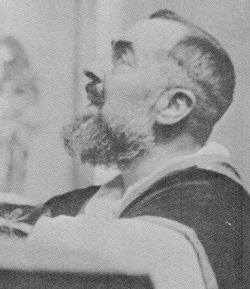 Paschal and St. Pio. After Holy Mass, the pilgrims went forward to venerate the relic of St. Pio before breaking for lunch in the pilgrim's hall or out in the beautiful sunshine. In the afternoon I gave the talk about God's love for us and the cross as the way through suffering to the resurrection; the role of St. Pio as shepherd, father and icon of Christ crucified; the need for a good confession and the dangers posed to the spiritual life and growth to Christian maturity posed by misuse of TV; Christ's knocking on the door of each of our hearts to call us to repentance; and the need for us to take the Bread of Life out into our spiritually starving nation. We also joined our prayers and thoughts with those on the Pilgrimage of Reparation and Prayer for the Sanctity of Life which was taking place under the leadership of Westminster's Bishop John Arnold over in Walsingham at the very hour of our talk. 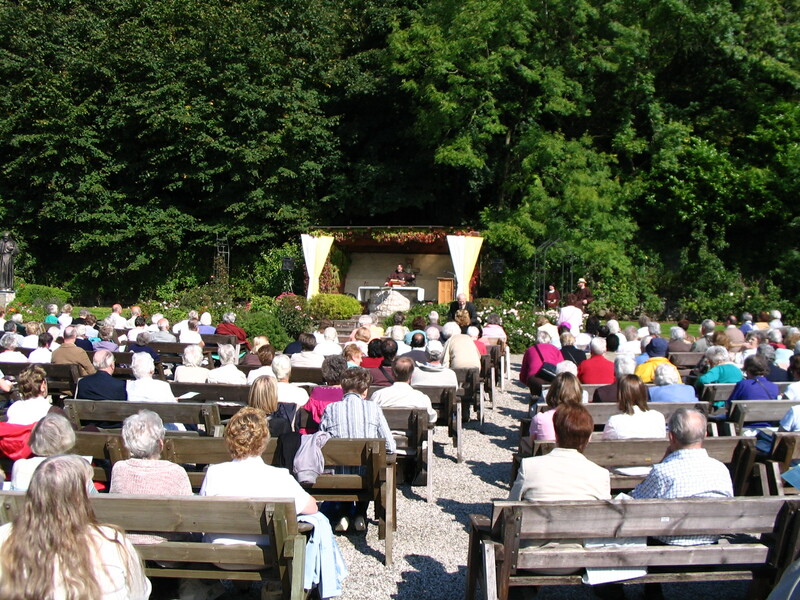 There then followed a blessed time of Eucharistic Adoration beneath the baking sun with several groups offering individual prayer ministry and several priests hearing confessions. A great sign of communion in the Body of Christ was the presence of Fr. Shaji Punnattu to assist with the large number of penitents. Fr. 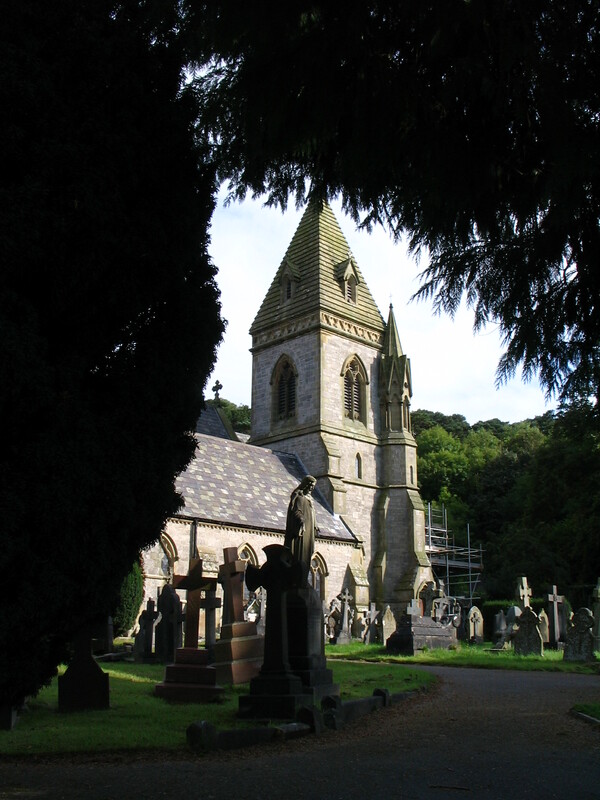 Shaji is one of the Vocationist Fathers who arrived recently to run the parish of St. Winefride's down the road near to the ancient Holy Well of that great welsh saint and martyr for holy purity. The arrival of the Vocationists represents a real blessing and asset to the Church in these lands. St Pio - A Great Saint for our Times! Well, the research is done, the talk is written and tomorrow is the big day at 2.00pm at the Franciscan Friary at Pantasaph. 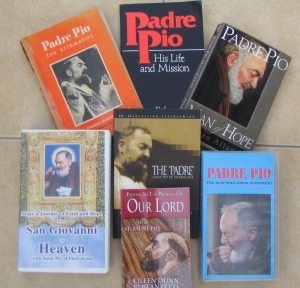 During recent days, I've been very moved, challenged and inspired by reading more about St. Pio. All these resources are good. The little prayer and meditation book called Praying in the Presence of Our Lord by Fr. Benedict Groeschel CFR has been very helpful and I recommend it as a support for those seeking more time with the Lord in the Blessed Sacrament. It strikes me more and more that St. Pio truly is a saint for our times and a sure guide for young people today. Hopefully, it wont be too long before we see Catholic churches getting built again in these isles and some of them taking the name of St. Pio. Wouldn't that be something! 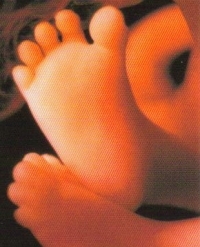 Image of the feet of a baby at 11 weeks after conception taken from SPUC literature. I know there is a lot on this Sunday, what with the St. Pio Day of Prayer at Pantasaph in North Wales and the Harvest Festival at Little Crosby, north of Liverpool. Nevertheless, this is very important; Bishop John Arnold of Westminster Diocese and Fr. 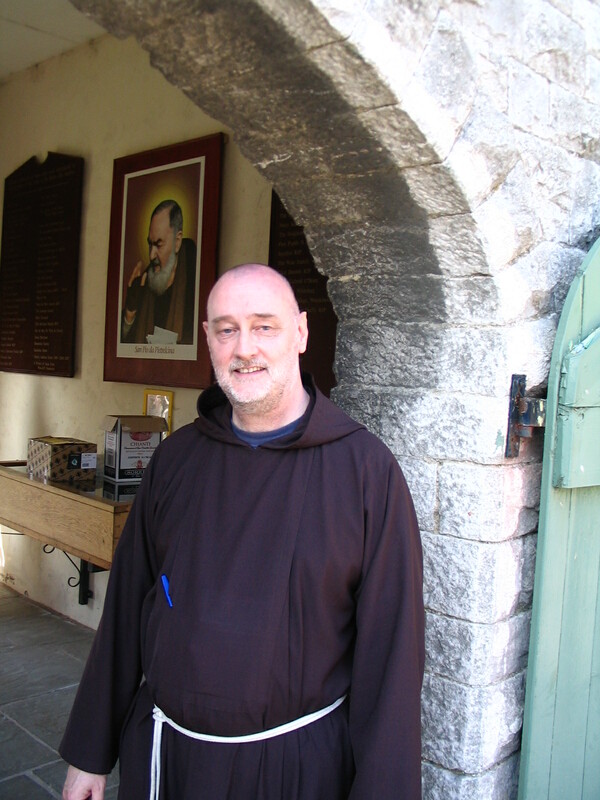 Jeremy Davies of the Franciscan Friars of the Renewal are leading a Pilgrimage of Reparation and Prayer for the Sanctity of Life at Walsingham this Sunday 21st September. Even though we will all be separated across the miles, let us join our hearts for the intentions and trust the Lord to make up for what we lack. Honestly - the lengths we go to for this Blog! Today is the Feast of another great Franciscan monk and saint; Joseph of Cupertino (1603 - 1663). 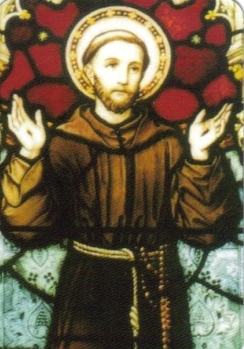 This gentle and kind soul was nicknamed the 'Flying Saint' after entering an ecstatic state, and soaring above the crowd during the procession on the Feast of St. Francis during his 27th year! From then on he would be raised from the ground during Holy Mass; on hearing the holy names of Jesus or Mary; or when singing hyms on the feast of St. Francis. He had a similar experience when bending down in humilty to kiss the feet of Pope Urban VIII. Only the order of his superiors could bring him out of the ecstasy and back to earth! St. Joseph was not by any means a natural scholar, but was infused with supernatural knowledge whenever called upon to answer intricate questions. For these reasons students and aeroplane passengers frequently implore his intercession. (Indeed, he is named as patron saint of air travellers). Being blessed with the odour of sanctity, he experienced the offensive stench of souls who were not living in the State of Grace and would encourage them to repent and make a good confession. Our other 'high flyer' for today is Piers Shepherd whom we have learned is back in England safe and well after completing and graduating from his 3 years of study at Franciscan University of Steubenville. A fellow Brit, one of Piers' years of study overlapped with one of ours; meaning that we could keep up the British side together in the Sacraments class! Piers would be an asset to any potential employers; he has a BA in Film and Media, the MA in Theology and Christian Ministry and is a truly committed Catholic. Welcome back Piers old chap; Blighty sure needs you! In the wider Church, today is the feast of that great Italian, cardinal and theologian, St. Robert Bellarmine. My mum and dad's parish in Bootle is named for him and today is a special feast for them (which is celebrated by the singing of a hymn specially written by one of the parishioners). 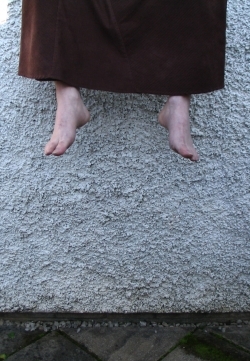 With our parish being the Franciscan friary at Pantasaph we are keeping the alternative feast of the Stigmata of St. Francis. The above stained glass window is found in the friary church of St. David of Wales. The first time I encountered the stigmata of St. Francis was in a Catholic bookshop that I had wandered into when I was a teenager. I was not a Catholic back then (indeed I was very anti-Catholic), but I was squeemish.I angrily fled the shop thinking Catholics were sick and wierd! All of which shows the effects of Grace on a poor sinner! Today I love the Church and I think that little St. Francis must be one of the greatest saints in history. He has also profoundly effected the direction of my life at key moments. I now understand the stigmata as a rare gift given to chosen souls to be so intimate with Jesus that they become so like Him as to share even the sufferings which He bore out of love to redeem us from sin. 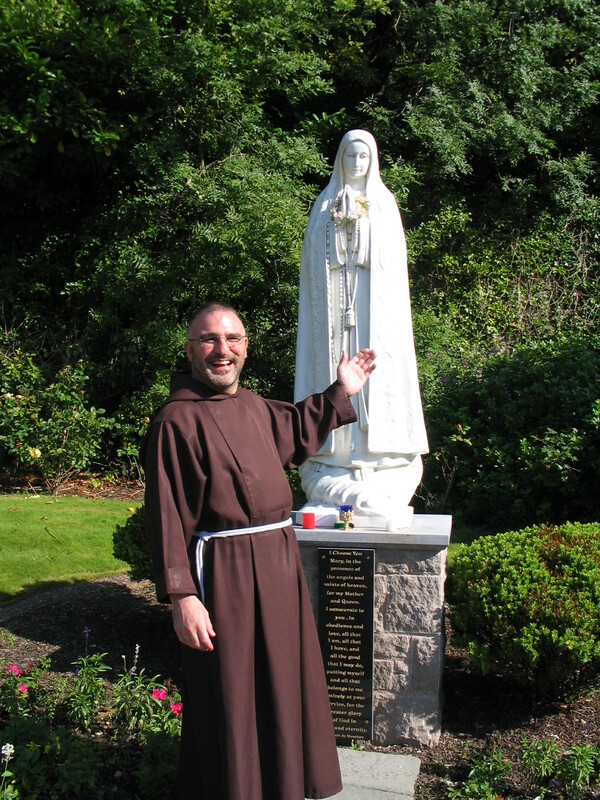 This weekend I am giving the talk at Pantasaph at the St. Pio Day of Prayer on Sunday at 2pm. St. Pio is a faithful son of St. Francis who also bore these miraculous wounds of Christ to suffer souls into the Kingdom with the Lord. 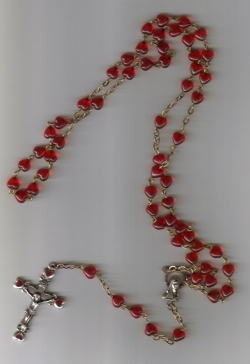 A few coaches are coming along and we will have the Rosary in the morning, followed by Mass, Lunch, the talk and then a Eucharistic Holy Hour in the Church. You are warmly invited to come along.